Configuration steps required on the MM side to enable computation of Service tax and Education Cess in the Service order. In this path, choose 'Define Condition Types'. Select JMO1 and Copy it. Enter target name as JSRT and description as 'A/P SERVICE TAX '. Save this condition type. Again in the same customizing activity, select condition type JEC1 and Copy it. Enter target name as JEC3 and description as ' A/P ECS for ST '. Save this entry. Outcome: The two tax conditions, one for Service Tax and the second for Education Cess on Service Tax have now been created. 1. Create a new tax posting key VS7 and VS8. Note: If there are multiple service tax registration numbers, you need to have separate account posting to different GL accounts based on service registration number. This can be done provided a separate tax code is maintained for each service registration number. To achieve this you need to define a set of 2 separate G/L accounts for service tax and Education CESS on service tax respectively, for every service registration number. For the new account key, enter the chart of accounts being used. 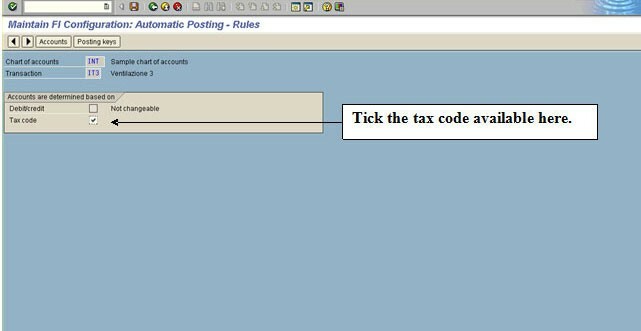 Select the PF status ‘Rules’ and tick on the tax code. Now maintain different account based on the tax code. Since the tax code will be specific for a plant you can achieve posting to specific account for a plant. This should be maintained after configuring the tax procedure. You have to define the required tax codes. Select VS7 and give chart of accounts. Select the PF status ‘Rules’ and tick on the tax code. Now maintain different account based on the tax code. Since the tax code will be specific for a plant you can achieve posting to specific account for a plant. Note: The same procedure has to be followed for VS7 and VS8. 2. Assign the posting key VS7 and VS8 respectively to the tax condition JSRT and JEC3 in the tax procedure as given in the screen shot below. After the tax procedure has been configured, please create tax codes as desired. In addition create the required number of G/L accounts for the Service Tax Interim Accounts. Go back to the Account Keys VS7 and VS8 and maintain the newly created tax codes and the respective G/L accounts. The next step is for the condition JSRT and this is computed with the value in step 100 (Base Price) as the base. The step following JSRT is JEC3. This is computed with the value in step 246 (Condition type JSRT) as the base. There are two subtotals after the new tax conditions in this procedure. Please note that these steps need not be the same in your tax procedure. This is merely an illustration of the logic to be applied. These changes will enable computation of service tax and education CESS on Service Tax in the Service PO.